PJ Caposey is an award-winning educator and author of six books. Caposey served as the Oregon High School principal for four years and is currently serving in his fifth year as the superintendent of Meridian 223. Both districts experienced incredible turnarounds and received multiple national recognitions under his leadership. Caposey is also a sought-after keynote presenter, consultant, and professional development provider and has spoken at many local, state, and national conferences specializing in school culture, continuous improvement, social media, and teacher evaluation. 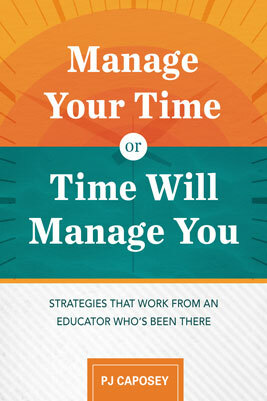 PJ Caposey identifies eight root causes of "time management difficulties" and provides treatment in the form of advice, support, and coping techniques for all educators.